Winemaker’s Notes: Big House wines are a rebellious mix of non-traditional grape varieties destined to give the imbiber a new experience. To wit this year’s prisoner is a captivating blend of aromatic whites that span the distance of the Alps themselves. With a nose that carries the vibrancy of spring and white flowers and lychee fruit that surround the senses. The palate opens up to tropical fruits, dried apricot, and white peaches. This wine finishes strong with a cleansing citrus zest that lingers. Pairs with fresh fish, Asian cuisine, or even Sunday morning fruit salads. My Review: I’m a big proponent of tables wines, and I feel as though that’s a niche that Big House wines has embraced and possibly even tried to make their own. Looking at the list of wines that are put into the bottle it’s almost disappointing to not see one labeled “kitchen sink”. There are times when a wine can try and do too much and end up falling flat, and while I’m not going to go so far as to proclaim the 2010 Big House White an amazing wine, for a $10 table wine, you can do a lot worse. On the nose I didn’t get much, though some of the white flower aroma did come through. In the mouth there were competing flavors of citrus and honeysuckle and dried apricot that gave this just overarching tropical fruit flavor that was light and somewhat refreshing. Paired with a dinner of chicken and cheesy potatoes the wine was a nice counterpoint to the bit of heat that was in the seasoning on the chicken and to the thickness of the potatoes. I’d be lying if I said this was a life-altering wine, but as $10 white table wines go, it’s average at worst. 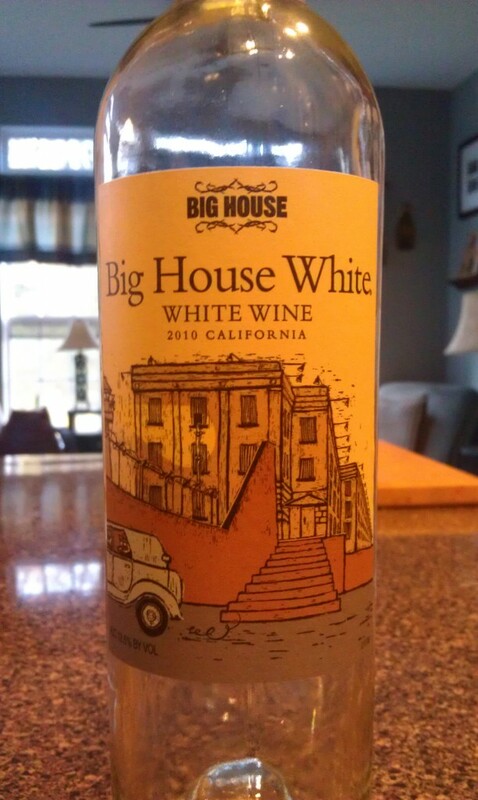 If you’re looking for a light white wine with tropical notes and a hint of some of the sweeter varietals you’d be remiss to at least not consider the 2010 Big House White.